Macchine Peterle and SIMI Anime have formed a group. The result is a company producing core shooting machines and using them twenty four hours a day for the daily production of sixty tons of cores for the automotive industry. That’s why we are capable not only of producing cores for foundries but also of engineering machines producing by means of a reliable, effective process under control. 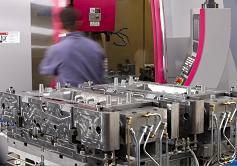 Today, our selective and prestigeful customers can be offered not only high grade and reliable core shooting machines, but simply the entire production line, starting from the manufacturing and setup of core shooting machines up to the supply of complete and tested systems, from the engineering of core boxes and shells to the execution of samples and pre-series in personalized and automated production units. The Simi-Macchine Peterle company has forty years of experience in the foundry field and is operating in thirty countries of the world.